It is the middle of the fall, when the leaves turn brown and die, as so do the sitcoms. 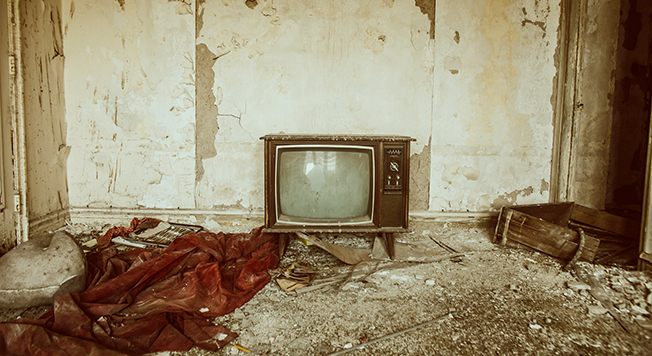 This has been a notably bad year for new broadcast TV—multiple networks are watching all but one of their new series decompose rapidly while legacy shows hemorrhage viewers to the perpetual menaces of cable, video games, online content and *shudder* talking to family members. Below we've broken down where each network stands. Oh, and we're not going to do a full analysis of The CW, but both their new shows, Flash and Jane the Virgin, are A) fun and B) doing great. So hooray for them. Arrow is also getting some recognition for being good, so it'll be interesting to see if anything happens to that show's ratings as it enters mainstream (read: media) consciousness for the first time. Also, all the ratings below are live viewers in the 18-49 demographic, as of Friday, Oct. 31 (except where noted, because networks were busy a-canceling things this weekend!). What got canceled: It is with a heavy heart that we witness the demise of another silly-fun ABC sitcom about attractive people in their 20s bein' wacky. We liked Manhattan Love Story (final average demo rating over four episodes: a whopping 1), but it is dead now, and as goes Manhattan Love Story, so goes ... probably a lot of the fall slate across all four majors. What's going to get canceled: Almost undoubtedly Selfie (1.2 rating thus far this season, which is not good). The show is more ambitious but less good at what it's trying to do than Manhattan Love Story was. Also possibly Cristela (1.17, which is bad, but the show is on Fridays at 8:30, so you have a chicken-and-egg thing going on here), although we did get a catty email from one of the producers with the show after innocently observing that it was terrible, informing us that his show was bound to get moved to Wednesdays. That may yet happen, so good luck to all involved! It's not looking great for Forever, either, but that show is still doing so much better than anything else ABC has tried in the 10 p.m. Tuesday slot over the past three years, so perhaps it will merit at least a full season order. Of the series already running, Revenge appears to be doing its absolute best to get canceled; it's down 20 percent year over year, and Resurrection is off by more than a third. Agents of S.H.I.E.L.D. is down to a 1.7, but as we've observed before, it's joined at the hip to a multibillion-dollar movie franchise that now has roughly seven bajillion new installments, so it will be around for a while. What's doing well: Black-ish, which fell off a little but still maintains a 2.72 average, got a full-season order, as did (of course) How to Get Away With Murder, which is—brace yourselves—seriously the only new show to sustain above a 3 rating. It's holding steady at 3.18. Of the series already running, Scandal is an unstoppable ratings machine, Grey's Anatomy is still solid, Modern Family looks great, and everything not on this list or the other is probably OK at this point unless its viewers decide to abruptly abandon it. Oh yes, and Once Upon a Time is still riding high weeks after dropping the Elsa bomb. Viewers like fantasy programming these days. Full season orders for: Black-ish. Also How to Get Away With Murder, which has always been planned for a 15-episode first season. The Forecast: At the moment it looks like ABC is 2 for 6, with Murder and Black-ish unqualified successes and Forever, Cristela, Selfie and MLS all in various stages of decline. We'll probably see Fresh Off the Boat sooner rather than later. What got canceled: UPDATED: Bad Judge and A to Z have just been canceled by the network. See below for why. What's going to get canceled: A to Z, almost certainly. It's like Manhattan Love Story, but without any of the charm, and it's doing a 1.03 average demo rating, so, yikes. Bad Judge is down to a 1.2, but honestly, beyond that, it's hard to tell. Of the series already running, The Voice is off by nearly 12 percent on Mondays and a little under 5 percent on Tuesdays—not bad, but American Idol circa 2004 it ain't. Law and Order: SVU is down to a 1.8 but barring the surprise unmasking of Ice-T as the Tylenol Killer on the front page of The New York Times, it will outlive us all, like Twinkies. About a Boy is way down, more than 20 percent year over year, putting it at about 1.4. What's doing well: Marry Me, as a just reward for being cuter than all known buttons, looks safe for the moment with a 1.9, although it is a 1.9 and falling rapidly. Constantine is pulling a steady 1.4 on Friday nights, which is not great in broad terms, but it's about even with Grimm, the show it's wisely paired with, and it's actually not bad at all for the time slot. Of the series already running, The Blacklist continues to be in the best shape, with Chicago Fire doing well, too. Full season orders for: The Mysteries of Laura, which is itself a mystery. The forecast: NBC has done some strange things, including ordering a full season for a show that does a 1.5 in the demo at 8 p.m. on Wednesday against more or less nothing, before Thanksgiving, and canceling a midseason show (which they desperately need!) called Mission Control before air. Honestly? We don't know. They have some interesting drama options, but they're in trouble on the comedy front. What got canceled: UPDATED: Tuesday's edition of Utopia got yanked a while back, and as of Sunday Nov. 2, the whole gigantic experiment is shut down. See below for details on ratings; we still don't know what Friday's frame did (now the series finale) but it probably wasn't anything to write home about. There hasn't been an official announcement on Mulaney, but production is reportedly shut down. What's going to get canceled: Mulaney (1.03), Gracepoint (0.9, yeah yeah, it was a "limited series," but if you buy that I have some beachfront property for sale), Red Band Society (1.08) and Utopia on Fridays (a bottom-scraping 0.65). Honestly, given the expense, it's a little baffling that Fox has left Utopia running at all. Of the series already running, The Mindy Project is probably in the worst shape (a 1.1); it's two seasons away from syndication where New Girl only has one to go and is all but guaranteed another go-round. It is down further year over year, though, off by 34 percent to a 1.38. Sleepy Hollow, too, is down by nearly a third to a 1.75, although that doesn't mean it's going to get canceled, necessarily. It mostly just needs to move away from Scorpion. What's doing well: Gotham (2.58), although it is steadily losing viewers. Full season orders for: Gotham. It's going to be like one of those Christmas-themed horror movies come year-end. The forecast: I mean, Fox has a reasonable bench. Rainn Wilson is funny, and his cop show Backstrom looks watchable. It's not really in Fox's wheelhouse, but OK. We worry about Bordertown, the latest diminishing return from exec producer Seth McFarlane. (Also, one of the Family Guy writers is the creator). Last Man on Earth looks fun. What got canceled: The Mentalist, sort of. It had been rumored for a while that the show wouldn't be returning after its upcoming half-season (which isn't scheduled yet), but CBS confirmed at the end of September. What's going to get canceled: Looks like nothing, at least from the crop of new series. We have yet to see more than one frame for The McCarthys, but the show did OK for its premiere (a 1.9). Next week we'll see if people are telling their friends to tune in or stay away. Of the series already running, the signs are ... nauspicious. CBS has had such a strong slate for so long that it has several possible cancellations waiting in the wings, the biggest of which is CSI, down more than 28 percent to a 1.38. Its episode order has been cut by three shows, as well. Rumors of a spot on the chopping block for The Good Wife have been circulating for a long time, and Hawaii Five-O and Blue Bloods are looking grim, too. The Millers is down 28 percent and has dropped below a 2 average; NCIS: LA is down more than 30 percent. Elementary is off by 19 percent. What's doing well: Scorpion is retaining reasonably well, with a 2.69 average; NCIS: New Orleans is solid with a 2.3; and Stalker's 1.74 is perfectly acceptable for a 10 p.m. show (although it's probably not everything the network had hoped given the series' pedigree). Of the shows already running, I would not be surprised if The Big Bang Theory was the last scripted show on broadcast to ever average above a 4 rating. Like The Simpsons, Family Guy and Grey's Anatomy, it is some kind of mutant. NCIS and Criminal Minds are doing great, and 2 Broke Girls is back and doing very well. Person of Interest is fine. Full season orders for: Scorpion (duh), Stalker (yay!) NCIS: New Orleans (of course) and Madam Secretary, despite not getting very good reviews or very high ratings (1.57 average). This makes some sense—the average is low, but not because it started high and hemorrhaged viewers; it's consistently doing a 1.5 now. So keeping the show around is probably wise, and it shows laudable faith in the talent. The forecast: As we said at the beginning of the season, CBS is making conservative, informed, smart moves here, so we're probably not going to see a major disruption of the traditional cycle. Long-running shows may get canceled, but The Eye is going to do its absolute damnedest to make sure there's something similar but with a slightly hipper edge waiting to pick up the next generation of people who like, say, crime dramas or multicam sitcoms. The only problem could possibly be the multicam sitcom in question—a 1.9 is not a great indication for the show's future, and its only prospective replacement so far is the Matthew Perry-starring remake of The Odd Couple. Perry's been asked to carry a few shows in the last several years, and they've all cratered spectacularly. (Studio 60, Mr. Sunshine, Go On—they're starting to stack up.) On the drama front, the network shines, but with Two and a Half Men going away and The Millers in trouble, it needs better comedy development.